So what is the Wagga Rail Trail? The Wagga Rail Trail is a proposed 21km sealed, off-road trail connecting Wagga Wagga CBD with the village of Ladysmith. The trail will largely be developed along the disused Wagga to Tumbarumba Rail corridor, linking the CBD, Equex, Governor’s Hill, Brunslea Park, Forest Hill, the RAAF Base and Ladysmith. People will easily access the trail along its length, and use it for walking, running, cycling and getting to and from home, work and community facilities. The trail will be developed for us – the people of Wagga Wagga. We are the ones who will use it most. Although visitors will undoubtedly enjoy the trail, its viability is not dependant upon attracting them. The trail is technically feasible, economically feasible and is strongly focused on the needs of our community. The Wagga Rail Trail will play an important role in linking communities and contributing economic, tourism, health and wellbeing, historical, environmental and community sustainability benefits to the city in the future. The trail will function as a viable transportation corridor. It will connect people with places they want or need to be. For children to get to school, for commuters to get to and from work, for families to get to sporting activities, for people to get to the shops or the park – they can choose the trail to get them there safely and actively. The trail will grow business investment and provide new jobs in our community through the construction phase, as well as in ongoing trail management and maintenance. People who use the trail will want to eat, drink and explore the trail and its surrounding attractions. Users of the trail will spend money, adding revenue to our local economy. The trail will generate tourism revenue by giving people something to see and do while they’re visiting our city. When visitors come for a CSU graduation or a Kapooka March Out Parade they may be encouraged to stay longer to enjoy the trail and nearby experiences. Every extra visitor night spent in Wagga increases the revenue generated by tourism and adds value to our local economy. The Wagga Rail Trail will help people incorporate exercise into their daily routines. We have seen how successful and popular the track around Lake Albert track has been at doing just that. Whether it’s an early morning jog or bike ride, a school sport group, a training run by the footy club, mum pushing the pram along the trail or a family group taking an evening stroll, the trail will encourage more people in our community to get active. It will be easy for people to choose a healthy, active lifestyle and to experience the significant health and wellness benefits associated with that. The Wagga to Tumbarumba railway operated for 70 years, from 1917 to 1987. Many reminders of the past still exist along the line, including stations, rail structures and historic bridges. The trail will preserve and incorporate many of these structures, as well as give people an opportunity to learn about our rail history. The trail will provide an opportunity for people to experience nature with minimal impact. Farmers in the Kyeamba Valley near Ladysmith have a long history of involvement in the Landcare movement. Trail users will see and learn about the positive environmental work undertaken by many. The natural environment along the corridor will also be protected and enhanced with plantings of native vegetation to link fragmented habitats and protect vulnerable plant and animal species. The trail will become a source of community identity and pride. These effects will magnify as the trail increasingly provides access to nearby historic, cultural and environmental resources and attractions. The trail will preserve the historically significant rail corridor and provide an opportunity for communities along the route to develop their own recognizable identity. 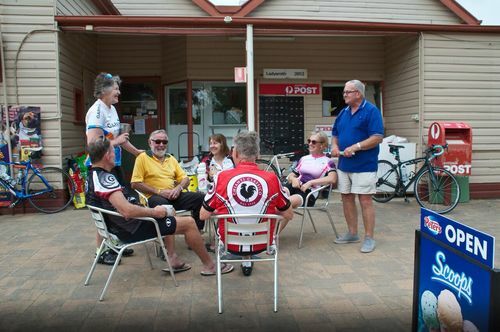 So the big picture is that the Wagga Rail Trail has the potential to become one of the most important economic, tourism, and recreation developments in Wagga Wagga.